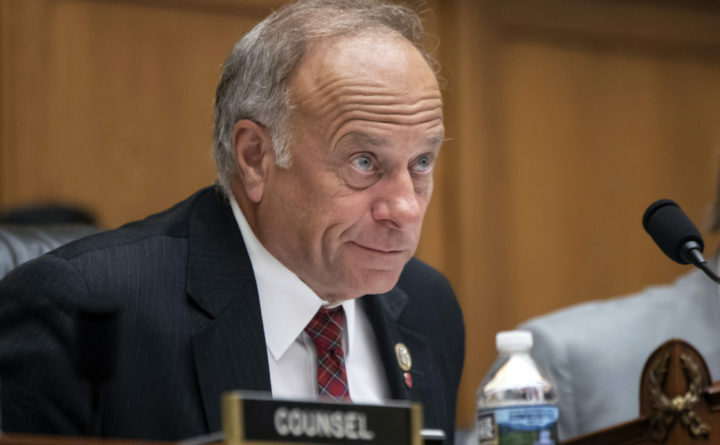 Rep. Steve King, R-Iowa, at a hearing on Capitol Hill in Washington, June 8, 2018. The right wing’s iron triangle — President Donald Trump’s White House, Fox News and the Trump cultists — had a bad day Tuesday. Consider all that occurred. It’s not clear if Wohl lived in his mother’s home (or maybe the basement thereof). Fiction writers rarely make up characters this stupid. Finally, on an already poor day for xenophobic right wingers, “The chairman of the House Republican campaign arm on Tuesday condemned recent remarks made by Rep. Steve King, R-Iowa, on white nationalism, becoming the highest-profile GOP leader to rebuke the lawmaker to date,” The Post reported. (Why he wasn’t thrown out of the caucus years ago is something he should explain.) The Post also reports, “Land O’Lakes has withdrawn its support of a conservative lawmaker after the dairy company’s political donation churned up online cries for a boycott of its products.” It surely seems that some of King’s support is melting away; a new poll has him in a statistical tie with his Democratic opponent. Is this all Gilbert and Sullivan comic opera or is it a sign that dangerous authoritarian nationalists are running wild? There are two competing takes. One perspective is that these people aren’t evil geniuses; they’re clowns. They can be exposed, mocked and beaten. The other take is that right-wing extremists often seem clownish from the outside but their loony rhetoric and hoopla (biggest crowd ever!) should not be taken as a sign they are incapable of doing terrible damage to a democracy. You don’t need to go back to 1930s Europe to see this latter phenomenon — just take a look at Brazil, Poland, Hungary, Italy and Turkey. It’s tempting to laugh off the antics of right-wing nationalists, but we do so at our peril. Certainly, they don’t really have the capacity to govern or engage in rational debate, but that’s sort of the point. Their goal is to disrupt, discredit government, confuse or eradicate truth and induce the people simply to put faith in a cultish leader. There’s nothing the least bit amusing about that.